This author has been having a hankering for a Tiramisu for sometime now. That first taste of bitter chocolate, countered by the creaminess of an ethereal layer of creamy sweet mascarpone, followed by a heady blast of Marsala wine and coffee-soaked fluffy sponges they call Savoirdi. Watching To Rome With Love has both assuaged and galvanized these cravings at the same time. We realize that likening a movie set in Rome to an Italian dessert might not be the longest leap of intellect. However, when a movie lifts your mood from the word go, and then keeps it going higher and higher on a steady incline, what can we compare it to but this dessert that is even called a pick-me-up (that's what Tiramisu means)? 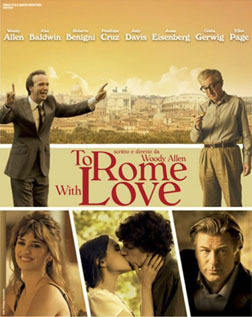 To Rome With Love is a funny, whimsical palate-cleanser, like the delightful effervescence of a foamy amuse-bouche, like the exhiliration of champagne with strawberries, like... we should probably stop with the food metaphors before we get ourselves too ravenous to finish this thing. In the movie, a series of vignettes tell four different stories that are only related to one other by the venue. Not people, not events, not themes, not even the timelines. Jerry (Woody Allen), a retired opera director who was persistently unsuccessfull due to his being "ahead of his times", and Phyllis (Judy Davis), Jerry's psycho-analyst wife, fly down to Rome to meet their daughter's fiancé. Antonio (Alessandro Tiberi) and Milly (Alessandra Mastronardi) are newly-weds from a small town, who are in Rome to facilitate Antonio's career, only to get accidentally separated due to a sartorial emergency. Leopoldo (Roberto Benigni) ends up becoming "famoso per essere famosa" (famous for being famous), as he is told by his new chauffeur when he wearily asks him "Why me?". And then comes the more-than-a-little-crazy story involving Jack (Alec Baldwin), a famous architect; John (Jesse Eisenberg), an aspiring architect he bumps into; John's girlfriend Sally (Greta Gerwig); and Sally's " intensely sexual" best friend Monica (Ellen Page). Like a tapestry woven out of seemingly discordant colors, all these threads come together to form a thing of great beauty, aided by the insidious smartness and spryness of the screenplay, the chemistry between cinematographer Darius Khondji and the beauteous Roma, the settings, and the seamlessly inculcated background score. Then, of course, there is the absolute real-ness of the characters, which has you empathizing with them and rooting for them even when the circumstances don't bear even a passing resemblance to reality. And in every frame of the movie you can detect the all-pervasive cheek of Woody Allen. At 76, he brings a whole new dimension to his neurotic/insecure/brilliant schtick, as an actor and a director. Roberto Benigni's bewildered, frustrated act as the bourgeouis clerk who is hounded by paparazzi for no comprehensible reason is effortless. Jesse Eisenberg is thoroughly adorable and perfect for his role. Alessandra Mastronardi is enchanting as the young and beautiful ingenue who gets lost in the exciting city of Rome. Pelelope Cruz, as a prostitute and the character Antonio's accidental "wife", is very likeable. That's the thing about the movie - you just like everyone and everything so much. Like a naughty toddler pretends to not know just how adorable it is, To Rome With Love charms you with its very nonchalance. And like the said toddler, it's sure to leave you smiling beatifically. fullhyd.com has 700,000+ monthly visits. Tell Hyderabad what you feel about To Rome With Love!